From 1987 through 1995 La Posta published a series of 11 postal history monographs by a variety of authors. A complete list is shown below. 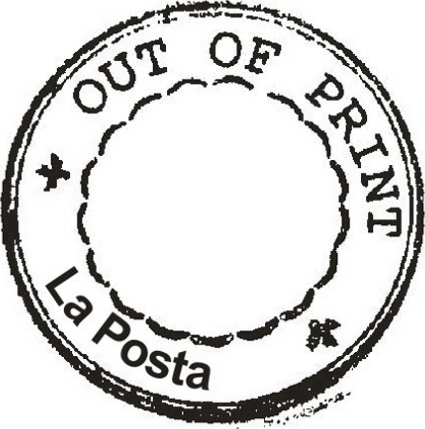 All are out of print and no longer for sale from La Posta. Postal History of Louisville, Kentucky by Louis Cohen, 1987, 77pp. Prexie Postal History: An Anthology Examining the Postal History Possibilities Presented by the 1938 Presidential Series edited by Richard W. Helbock, 1988, 100pp. Colorado Illustrated Covers by Kenneth Segerstrom, 1988, 104pp. The Postal History of Montana through June 30, 1870 by Daniel Meschter, 1989, 91pp. Walter D. Wesson’s “Time on Bottom” Duplex Hand Cancelers,” by Thedore Bozarth, compiled and edited by Russell F. Hanmer, 1990, 52pp. The Censorship of International Civilian Mail During World War II: The History, Structure and Operation of the United States Office of Censorship by Steven M. Roth,	1991, 103pp. The Black Jack in Vermont by Durward Mommsen, 1991, 78pp. San Francisco Postal Markings, 1847-1900 by John M. Mahoney, 1992, 127pp. Redirected Mail: The Redirecting System of the US Post Office for First Class Mail, 1799- Present by Anthony S. Wawrukiewicz, 1993, 86pp. Pre-Territorial Colorado Postal History by Daniel Y. Meschter, 1994, 97pp. Military Mail and Civil War Patriotic Covers Used in Missouri by Robert Schultz and Ward Parker, 1995, 98pp.